Better ANC Technology - Mixcder's self-schemed chip achieves superior Active Noise Cancellation (ANC) by using a wider frequency range EQ adjustment to counteract bandwidth, so you can appreciate a serene listening experience. Superior Sound Quality - The sound quality is enhanced as well since we upgraded the headphone speakers. It sounds well-balanced with a decent level of bass, and shows a great performance from mids and treble. 30 Hours Battery Life - The Rechargeable battery provides up to 30-hour playtime in wireless mode when it's fully charged. Or it could play music with ANC for 3 days if you connect E9 to your device by the included audio cable. Accompany You Anywhere - The rotatable and foldable design makes it easy to pack and carry. The ultimate soft foam and protein leather ensure comfortable experience at any time. 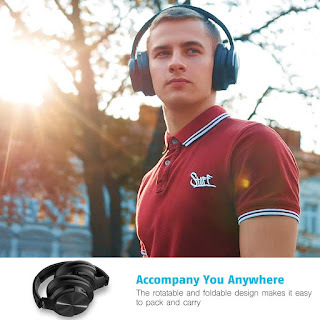 It's designed to accompany you wherever you are. Free Airplane Adapter - An airplane adapter is also included so that you can immerse yourself in music without disturbance on a plane for any trip. Now you could enjoy your favorite songs with your exclusive ANC headphones.